What’s So Great About a 1964? 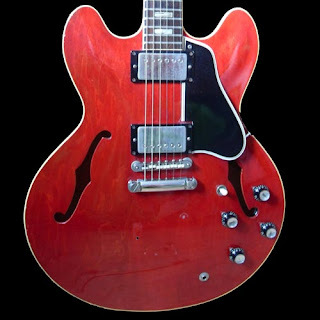 I wrote a post a few days ago about the 58 ES 335 and, of coursed, I raved about what’s so wonderful about it. I mentioned that the best ES 335 I ever played was a 58. And yes, it sounded better than any I had played but it wasn’t my all time favorite. There is nothing like a 64. Except perhaps a late 63 or a very early 65. Gibson doesn’t necessarily make changes on New Years, so there is always some overlap between iterations of these guitars. The neck on the 335s and 345s from 1958-1959 were big fat, full necks. Then, from 60 to early 63 they got skinnier every year. The width of the fingerboard stayed the same but the front to back measurement got very small. In late 63, for reasons unclear to me or probably anyone else who wasn’t there (at Gibson) at the time, they fattened it back up to nearly the 59 size. Nearly. Somehow, they got it exactly right from my perspective. A big handful of neck that starts out comfortable and gets slowly but evenly fatter as you go toward the body. I can play a 64 for hours with no fatigue. It’s too bad Gibson didn’t copy a 64 profile when they issued the Historic ES-335 63 Block neck. That’s a very nice guitar with a nice neck but its a little slim for me. The Eric Clapton reissue which was a limited edition that cost over $10,000 when issued and now commands a bit more, had that magical 64 neck carve and that’s pretty much the only other way to get that carve. There are late 63s with it and some very early 65s as well. 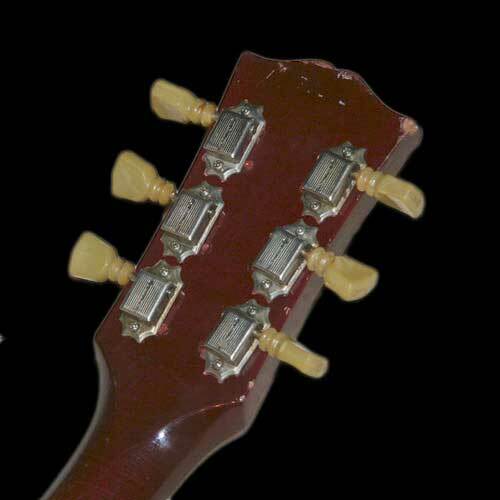 But in 65, they switched the tailpiece to a trapeze which some say decreases the sustain. I’m not sure I agree but I think a stop tail looks better and is way easier to restring. There were some early 65s with a stop but they are pretty rare. I had an opportunity to buy one not too long ago for a very reasonable price but I was just too lazy to drive to South Jersey to get it. I regret that decision. They are very hard to find. And what about the pickups and the sound of the 64? The 64 uses the first or second patent sticker variety of humbucker and these can sound every bit as good as the revered PAF. The bridge switched from metal to nylon saddles at about this time as well but that’s an easy swap if you prefer the harder edge of the metal saddles. I kind of like the nylon ones and they don’t break strings as easily. It’s no wonder Mr Clapton played a 64 for so long. And it’s no wonder that his 64 went for over $800,000 at auction. Not so much because it was a 64 but it was his 64. If you have one and you want to sell it, I want to buy it. I love these guitars (have I mentioned that?) Here’s one below from www.ES-335.net-my favorite 335 site hosted by my friend, Tom Hollyer. You can see the telltale holes from a formerly mounted Bigsby. These 2 little holes will save you a lot of money as they can drop the value of a 335 by 25%. And yet, they don’t hurt the tone and they aren’t noticeable from more than 5 feet away. Note the pointier “ears” as well. The rounded “Mickey Mouse” ears were gone by mid 63. And above it is that great neck profile. You can’t tell much by looking but you can see it’s got some heft to it. Hallo Charlie,keep the good work and this web site alive.I agree a 64 ES335 is a must have.Took me years to find me one.Now it's here and not going anywhere. Enjoyed reading your view on thiner nexs es335, ive just received my 1967, the tone blows me away. Its taken a few hour to get use to it, what a great guitar. look forward for more positive views on late es 335. I just got a 68 which I kind of like. Thin at the nut but plenty of neck. Sounds almost as good as my 64. I think it is possible that I purchased in 2011 , somewhere in New Jersey , a 1965 Gibson ES 335 with a stop tail. I am thinking this may be the same person you were going to buy the 1965 335 from. It is my first and only 335 and my favorite guitar that I own. Funny how I ended up with this 65 , because I had just purchased one on Ebay , a 1971 for 3k , but it got lost in the mail (you heard right!) I was so upset at first because I felt like I got a great price (this is in 2011) and I never got to play it. Well that led me to The Gear Page looking in the ads for 335’s and I found the 1965 for $3, 200.00. So I went to the guys house and picked it up. Best guitar deal of the century for me! Could be. I get beat out for guitars all the time. Being a dealer, I need to leave room to actually make a buck or two so I generally can’t compete with retail buyers. Good for you. I wish I could buy them all.